MAP OF HEAVEN - 'X' MARKS ANOTHER SPOT! Sadly many are writing to me insisting the TV series is intentionally turning the archaeoastronomy secret of Oak Island into chaos while keeping people entertained. Am I surprised? No. Some say this is an intentional cover up at play. 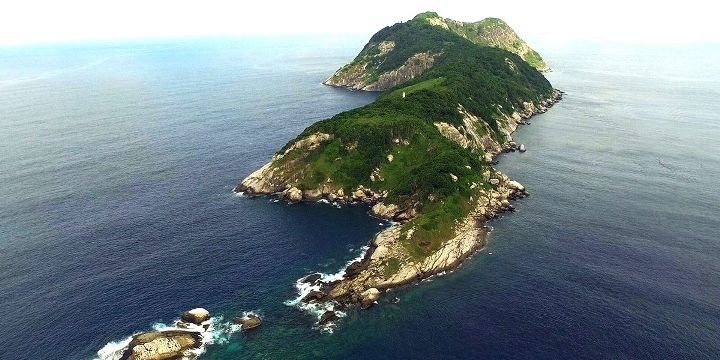 Well... the shape of the island you will find out was a rare sacred heavenly shape upholding the legend of "AS ABOVE SO BELOW" and the Templars searched the seas far and wide to find these magically natural but coincidently 'special shaped' islands. Only if they had the very important smaller island or rock protusion offset at the right place that was seen as even more sacred than the main island itself. Why? The simple reason ... so future Templars who were the only people on Earth at the time would later on crack the secret 'map of Heaven' code and retreive their treasure. ANOTHER APPLE ISLAND CLUE ... Once referred to as the Hollis st treasure map stone, now aired on the TV series Curse of Oak Island has the same 'Map of Heaven' Templar template. The number 54 and tiny arrow inscribed on the Apple Island correlating relief suggests where the once Templar treasure lay. 54 paces North puts you near center of the island and the right height above sea level to dig without flooding the pit. My belief the treasure is long gone since this easy to recognise Templar/Jerusalem City of David template was important and possibly well known to Templars over 100 years ago. 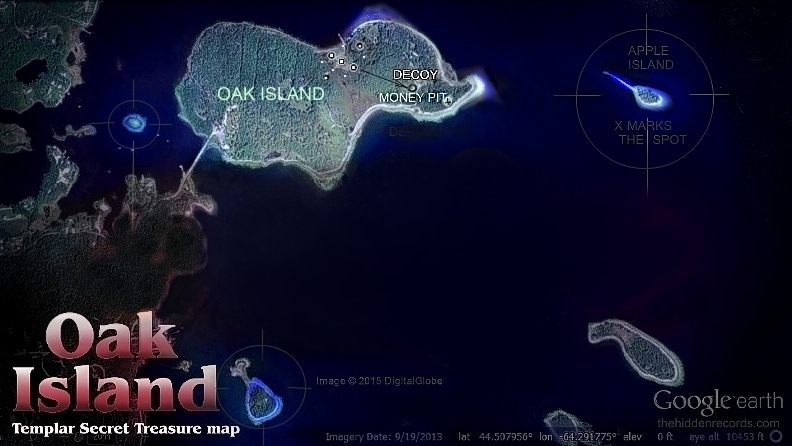 MYSTERY OF SNAKE ISLAND... A new TV treasure hunt series has targeted another Templar treasure island and for now all I ask is you look at the shape below of Snake Island and compare it to what is also hidden about the Oak Island 'Templar Template' ... you can figure with your new archaeoastronomy secret template where the treasure is or was once hidden there as well. Why is the island shape matching a bull's leg important as seen in this old map/ Why does it have seven dot markers (as well as the pit) on the island? How does it match the cosmic traditions of ancient Egypt's 'map of heaven' and the design of ancient Jerusalem? What would this apparent 'secret society' and Templar cosmic tradition have anything to do with decoding the 'x' that marks the spot with Oak Island? An island that the controversial Captain Kidd ref tried to decode in the early 1700's. Did he find the treasure? Did he stash some of it in the Bedford Barrens area? Are there any clues one can measure suggesting a possible chance the Lagina brothers might be tied to higher elite interests and secracy protocols and therefore taking the public on an entertaining but wild goose chase? 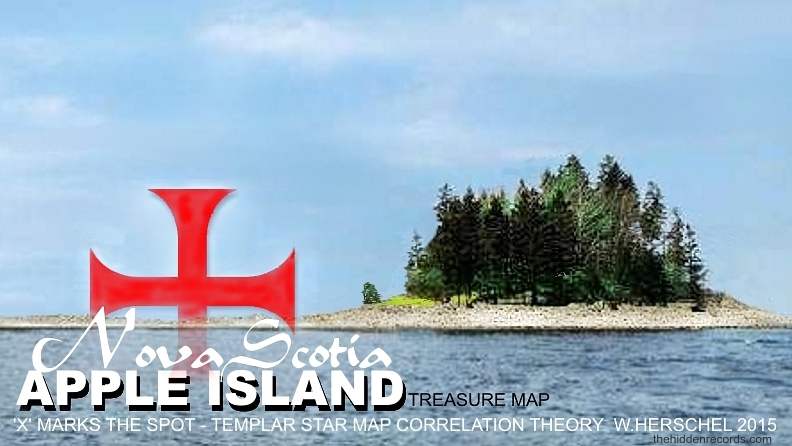 Is the real 'X' that marks the spot Templar matching map 'treasure' site on Apple Island being kept secret and being excavated since launching this story claim? Yes... Test it and measure all these new claims yourself using the references. Read on and decode the clearest collection of evidence ever compiled in this study. 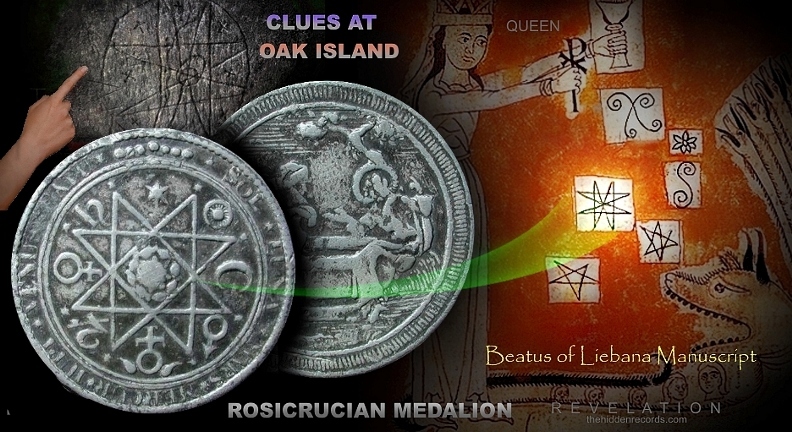 For centuries the legend of the greatest treasures of the Knights Templars ref has been enshrouded in mystery and cover ups, especially that of what has been claimed at a site called Oak Island in Nova Scotia ref seen in the image above. I will try piece the legend together here using my own findings to date which other researchers have not yet discovered or realised. They have all been digging in the wrong site as they fell for the most common Templar known secret of the Christian Cross that many would have known around the early 1200 to 1700 period. They missed the more complex deeper secret knowledge that the cross points to that the Templars had covered up for centuries. It was either during the time of the loss of King Solomons Temple in 1244 to the Turkish Empire ref or later during the destruction of the Templar organisation in 1314 ref when their greatest treasures were believed to have been moved to a secret location. 1) Would they make sure there are no visible traces at any buried treasure site? 2) Would they consider including a decoy site to fool hunters? 3) Would they want to come back and get their treasure later? The truth is, one has to answer yes to all the above and in doing so suddenly the whole story begins to head in a whole new direction. 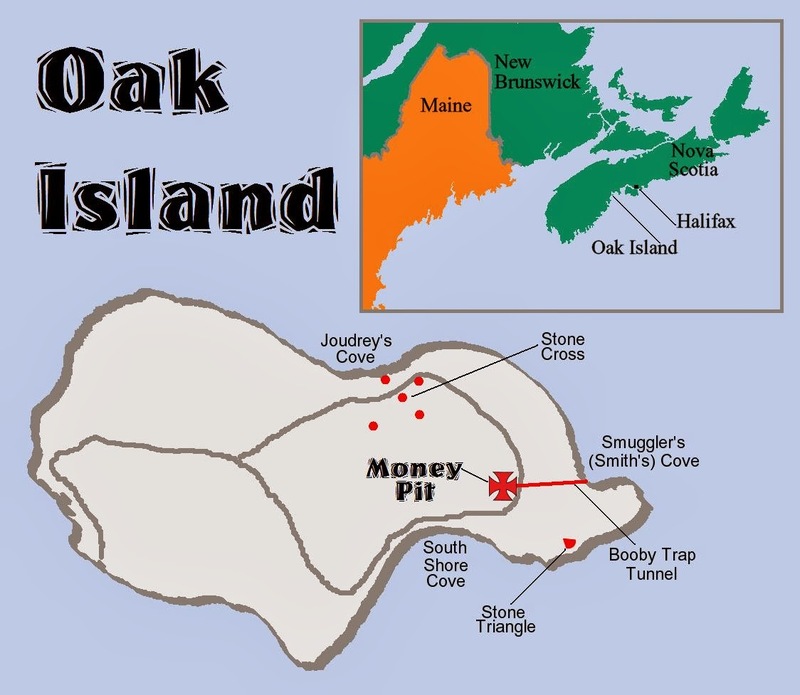 For the first time in the history of the Oak Island Money pit legend a TV documentary titled The Curse of Oak Island ref has been aired exposing many examples of clues that have been debated over the years. The series has revealed many anomalies with the Oak Island story including possible fake clues in my opinion by many of these treasure hunters motivated for profit gain rather than historical findings. These anomalies perhaps created false hope in the deep well to get more money from more sponsors. At this point I would say all the best pieces of evidence so far are only those of the Templar variety studied here. The show has recently also introduced a Roman sword discovery claim that clearly appears to be thrown in just for entertainment value. Do the math . Firstly, what are the chances a hand formed personally individual stylised created ancient roman sword would have been reproduced for a second time with same detail even in ancient times to start with? But more obviously obviously, since it correlates with the one in a million chance it is an item chosen to be replicated for public sales... the math rules. It is obviously a hoax presented and inspired by the priority for entertainment. The TV series has just presented a new theory on the stones placed on Oak Island (see top right of image below) that has been referred to as a cross formation so far aliging with what I propose is the decoy 'money pit' site. Personally I dont believe the stones were originally placed like this as it would have been clearly documented the last few decades in its entirety which it was not. Secondly, the positions are not a good Kabbalah match in correlation. For what it is worth in case I am mistaken here, I need to add another 'coincidence' for those thinking my theory is just a series of coincidences. 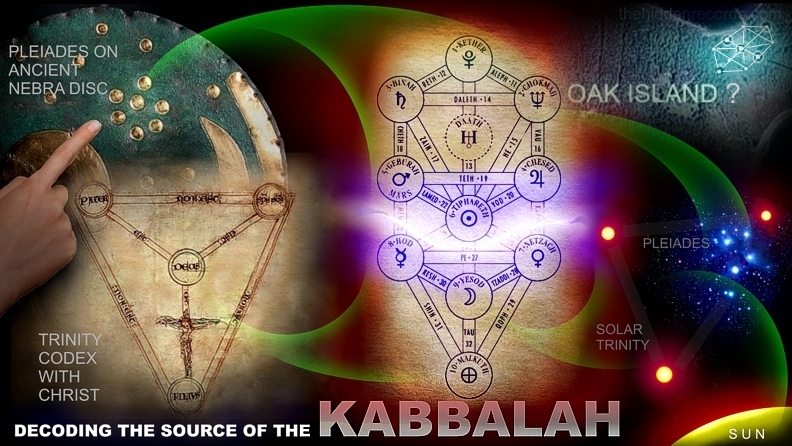 The Kabbalah is another one of my major breakthroughs identifying the encoded 'Map of Heaven' template that I propose answers this mystery layout in searching for the real 'x' Apple Island that marks the spot. You can test and measure the Kabbalah and its religion based icon counterparts at this link here ref . If the stones were placed to represent the Map of Heaven as Kabbalah here in alignment with the so called 'money pit', then it is in my opinion merely placed as a 'title' for the island marking sacred ground for the sacred treasure 'way shower' island. But importantly placed in this orientation as a decoy that non Templars would easily believe perhaps with spars knowledge it is showing the way to the money pit. A Templar of highest order would see one does not extrapolate alignment to the most sacred Blazing star target in this way. Although it is easily confused laterally positioned, it is not the right orientation to match the secret 'x' marking the spot... 'Apple Island'. It is worth including some of the remarkable findings of an anonymous expert in the field of historical Treasure hunting for historical truth rather than profit. He calls himself 'The Steward' ref and has recognised a valuable measurable historical breakthrough to complete what I will refer to as a common sacred Templar 'template' in history ref . In fact I wonder if the word Template originated from the Templars in this heavenly based pattern that is found all around the world. 'The Steward' is probably a rebellious family member or of either Templars or Freemasons not believing certain important things should be kept secret. He has shown he has extensive knowledge of amazing well referenced pieces of the puzzle. He has discovered some common themes between all Templar and Pirate treasure legends and historical records. He has identified the following common patterns in this order of importance, some of which he might not yet realise the significance of. 1) Most treasure islands in history are Templar related and were chosen to match a sacred repeating template. ref . 2) The template is based on a secret on the stars ref and the original Trinity ref . 3) Many famous Pirates show signs they were... Templars ref . Read full article. 4) The templates involve Egyptian and masonic symbols ref . 5) All the Templar records and maps were immersed in decoys and fake stories and hoaxes to throw off the most determined of non Templar seekers. ref . "AS ABOVE - SO BELOW"
Also how many of these historical maps dont actually place the tradition treasure map favourite 'X' marking the spot but leave the seeker of treasure needing to know Templar history and symbols to make sense of other Templar clues on the map to locate their treasure THROUGH A MASS OF DECOYS. Most of these islands have a perfectly suited smaller island following the bull's leg shape star map legend I have decoded around the world fitting the position in the sky where a sun star can be located. It was called the 'Bethlehem star' in the Christ story. One in the Book of Matthew states " ...that 3 kings (Orion's Belt) follow (alignment) from the east to find the star associated with Christ's "beginnings" ref . 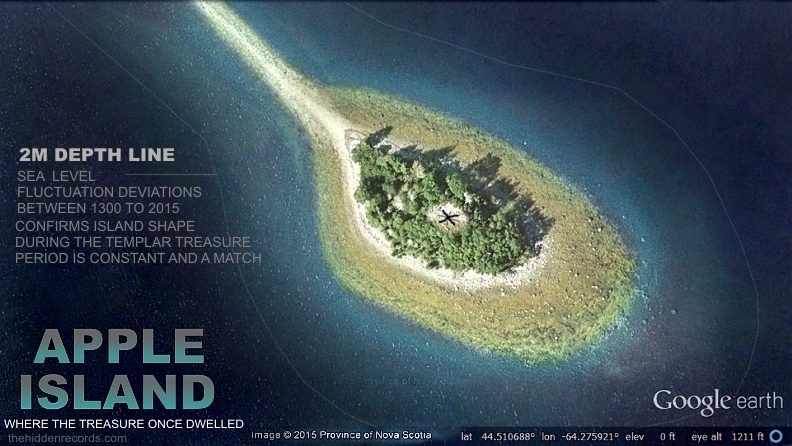 Here the treasure buried is probably again in the ultimate sacred place, the tiny island in the image above referred to as the "Great key. Consider Templar names and it is actually Solomon's Key that also unlocks the same secret ref . The story has it that on one of the rocky beaches on Oak Island close to the money pit area, a large flat stone was found with Templar inscriptions. The previous treasure hunters thought it might be an entrance to the money pit and decided to blow it up and see if there was anything beneath it. It had nothing beneath it but the rock was destroyed except the piece shown with the 3 symbols seen here and possibly a sacred feminine 'vesica pisces' symbol ref. Often a christ symbol too but Vesica Pisces importance as the place of a sun Star is debated here ref. The one center symbol is a standard Templar cross known to scholars between the 'H' and 'O' symbol. It is no contest either the 'O' symbol is a circumpunct as it has the Egyptian style dot at its centre which is perhaps the next most common symbol to the Templars. "The 'HO' symbol is also coincidently identical to the Gobekli Tepe 'HO' symbol. For me this is no surprise already believing both cultures had similar sacred encounters with cosmic teachers the Templars they believed were the biblical angelic encounters. 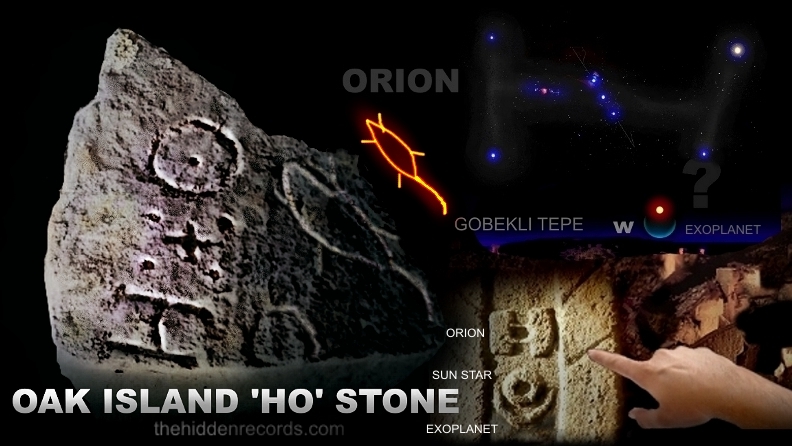 Orion is the correlation with Templar cross and it has its 'H' symbol designation for it as well like at Gobekli Tepe. Placing multiple symbols in different tradition for the same thing appears to be a status display of how high ranking so to speak the Templar treasure crew were in their quest to hide their ultimate treasure. As a starmap this stone can now speak its secret. It would have been placed in true alignment with East as Orion rises and the secret Orion holds for the Templars that you see all over my website articles. The combination of Orion with the Sun symbol is exactly what appears in the Grail story I have been fortunate in discovering. The Full Grail match to this depiction is here ref. This is the very same symbol as seen in the Bedford stone inscription that follows. It suggests what to look for as the 'x' that marks the spot... Apple Island! This will be clear once the Bedford Barrens two petroglyphs are mapped and scanned that will take this story in the right direction in leaps and bounds. The 'cursed' money pit and how it was discovered was not ever explained. It used part of the Templar/Freemason/Christian star map ref which is also the primary part of the Key of Solomon star map ref ... but it was incomplete. It used a stone cross on the island with three stones placed in a row duplicating the Orion's Belt alignment as it does in the sky to the sun star in the ancient star map hypothesis I offer as the solution to this mystery. The latest clue for me to launch this story was the 8 pointed star clue the real origin of which nobody recognised its real origin or maybe, it was simply just not allowed to be aired. Let's evaluate proof that the star map is the big deal in solving this mystery. 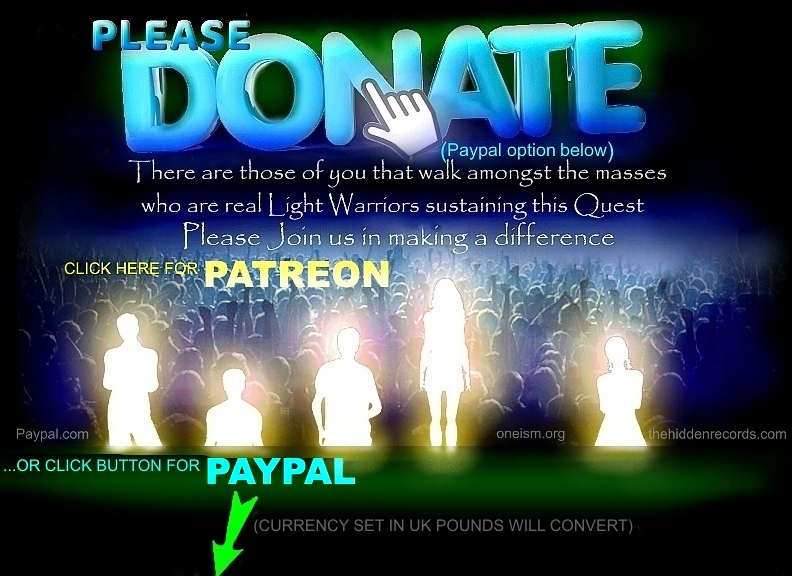 If you look at the image above referencing some other researcher's work identifying Templar knowledge (source ref )you will see the current claimed money pit location and three large rocks placed in a row that align with it with a line alignment showing the way. This was most likely how they originally located the pit in the first place. This is a map reference here in the link given and note the use of the Templar cross as the 'x' that marks the spot. It was a brilliant decoy and you will see why. 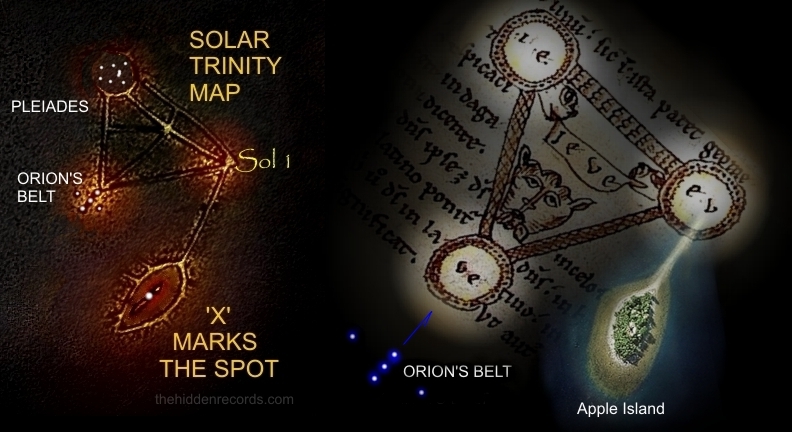 In my discoveries of the Templar/Freemason/Christian star map ref and the Key of Solomon star map I discovered the 3 stars of Orion's belt align through what the ancient records recorded as 33 degrees of arc ref to locate the Christ Sun star Sol 1 position. A Sun star that exists ref with a possible exoplanet and that I claim is the human origins star which all humanity ancestors are linked to ref . The Templars would want to use the sacred As Above So Below secret knowledge known in Hermeticism ref in picking the hiding place of their treasure and they would know that many a commoner might know the basis of the cross secret too and hence why they would need a decoy plan. One would need to know much more secret knowledge to crack their code and only the highest Templars would perhaps know Hiram Abiff's complicated astronomy knowledge ref of the place of our origins. Something hidden by all monarchy systems worldwide to enslave commoners who could then be manipulated more easily to fight the wars that would profit the Crown. One would need to find the "heaven template" in a real location on the ground as it were. 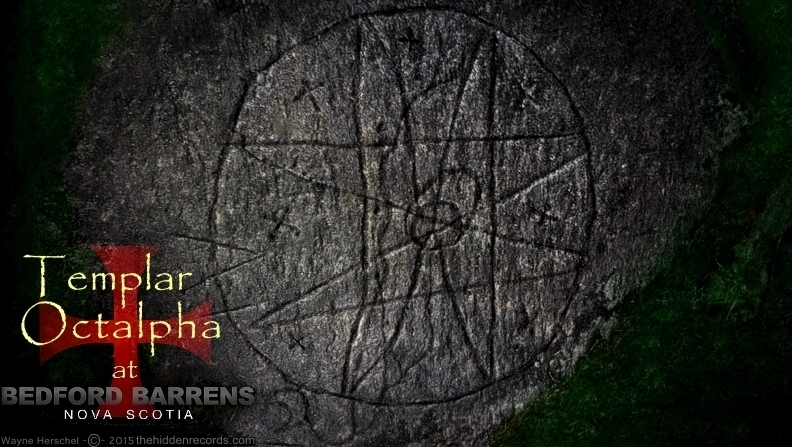 For me, the eureka moment when I realised it was time to look closer at the Island from above was when the brothers aired the 8 pointed star pattern on a rock carving in Bedford Nova Scotia which was very unique ref which is also shown above. I must credit the person who correctly identified the Symbol in the TV series as Templar sourced was corporation owner and bloomberg business magnate Jovan Philyaw ref who also heads a Treasure business operation and he is an ongoing guest on the History channel Curse of Oak Island TV show. I agree since this symbol we decoded in a Templar source document some years previously. Hungarian researcher Márton Molnár-Göb made the discovery. 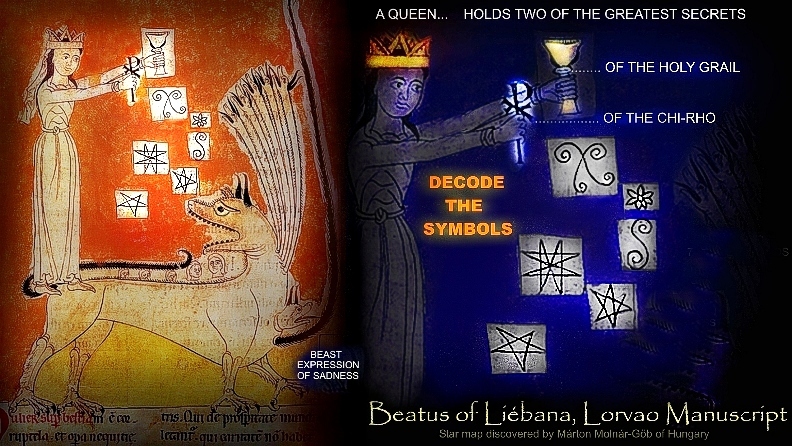 He identified the use of the symbol to title one of the Sun stars of the Solar Trinty in an ancient manuscript called The Beatus of Liébana, Lorvao manuscript ref depicting the whore of Babylon ref seen below. It draws an eye shape pattern with blazing star rays of light with a line attaching to it in the most important most sacred to the Templars... the star of the Christ... the Sol 1 position. 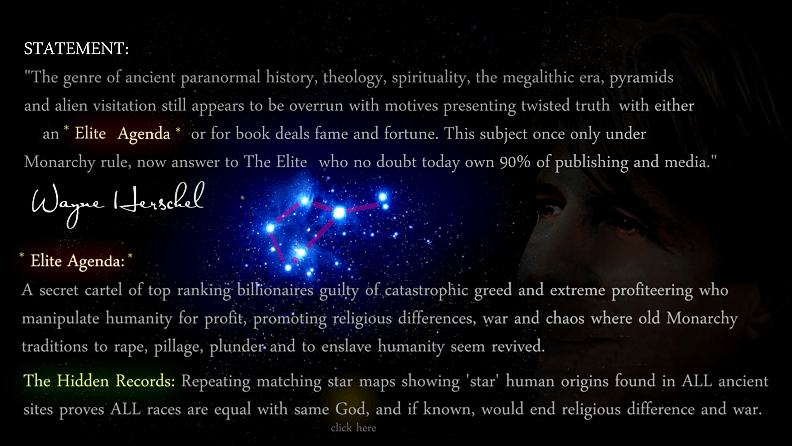 mouse-over the image below to decode the star map from the symbols and look for the 8 pointed star. The coin or sacred medalion ref with eight pointed star you see below found by fellow researcher Mark Scott, now has its secret meaning revealed and compared to its flip side and how the two fit together precisely with what I offer in the depiction. 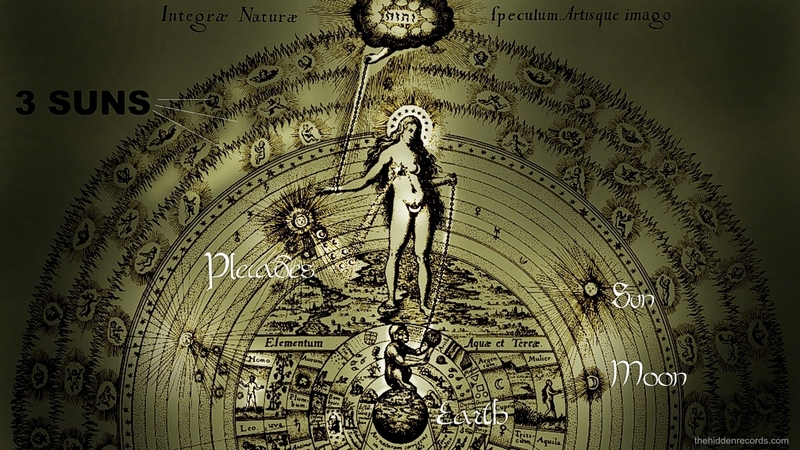 The Pleiades appear here as seven dots depicted on the coin with 3 suns, and on its flip side, Christ with sun halo as Sol 1 and the two others connected in a cosmic conduit wormhole. The astrology symbols are here also on the coin for the planets. I was looking more into the planet inclusion with the star map and realised something more obvious than my first thought it was a planetary positioning of a return event future date of a cosmic messenger. The time the coin was minted hundreds of years ago was when they thought these were the complete and only moving heavenly bodies so in essence we have a full ecliptic here with all the planets they had identified at this period. This is a message in itself to find where the fixed star map resides... its in Taurus and on the ecliptic where the planets pass but where on the ecliptic? Then I looked at the lower symbol position of Mercury and saw the next clue... it is an altered mercury symbol the identity of where in the ecliptic it encodes Taurus... the symbol for mercury here is altered to match exactly the Globus Cruciger shown in the image. The alignment place of Orion's Belt with Sol 1 in Taurus. Here is the original symbol for mercury and note it is upside down and no crescent included ref . 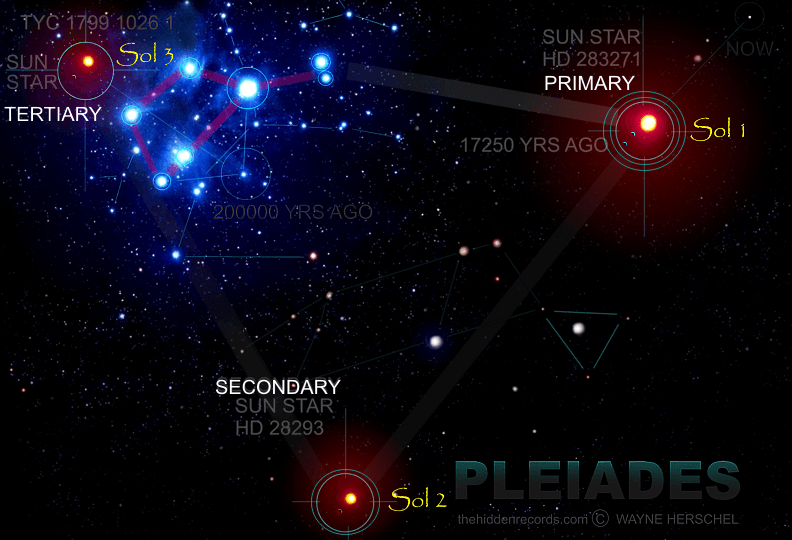 Finding the Globus Cruciger ref beneath the Trinity sun configuration with Pleiades makes this a more conclusive star map as the cross as Orion is aligning to it viewed from the earth as seen in the image below. 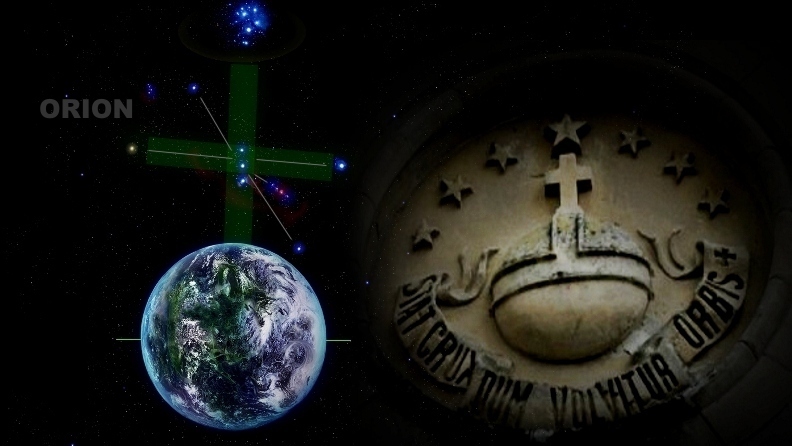 The Globus Cruciger explained as Orion here has a latin inscription found with the Cathusian order depiction shown claiming "The Earth turns while the cross (Orion) stays fixed in the heavens" ref . This eight pointed star is no ordinary star either. It has Templar origins and found on a rock not far from the legend of the treasure of Oak island where it is presented right next to another star map. The coin shown has the Rose sun at its centre defining its title as a specific sun star opening within the petals of the cosmic conduit wormhole. To see the story in context with the Rose Cross of the Rosicrucians then click here . The eight pointed star with this very unique geometry I believe has its origins in its earliest reference again as a star map in a forbidden Christian based manuscript that is used as an actual symbol title for one of the three sun stars there in a puzzle that correlates with the stars. Mouse over the image below to see the full star map. The special star geometry is found on a manuscript on the Revelation prophecies that a future queen appears to have hidden ref . This is an actual photograph of the Pleiades area with the leg of the bull pattern added and with the 3 Sun stars shown in correct positions and correct yellow spectral color but just enlarged for purpose of measurement of its layout pattern. These 3 sun-like stars are in contention according to the repeating accounts ref of the ancient star map cases I have proposed as the place of our star visitor human ancestors due to the ancient clues found with each case. These sun stars visual sizes, since they are of G class star catalogue type would be pin points here and not important looking at all to interpret in their layout positions. Few people realise that Sun-like stars like the size of our sun out there in their thousands are not possible to be seen at all in our night sky. Not even one! What you see as stars with the naked eye are 95% giant class stars that are nothing like sun stars, apart from Sirius and Barnard star and a few other 'no planet' and too extreme for life' stars which are our next door neighbours in the Milky Way Galaxy. The greatest star map to any Templar is the template of the their holy city of David in Jerusalem ref see below, which was decoded by Márton Molnár-Göb of Hungary ref . Mouse-over the image to see more detail. Jerusalem was their sacred template and the Templars honoured precisely the gnosis Moses brought from his knowledge of the Egyptian star map ref and his encounter with those that came from above. 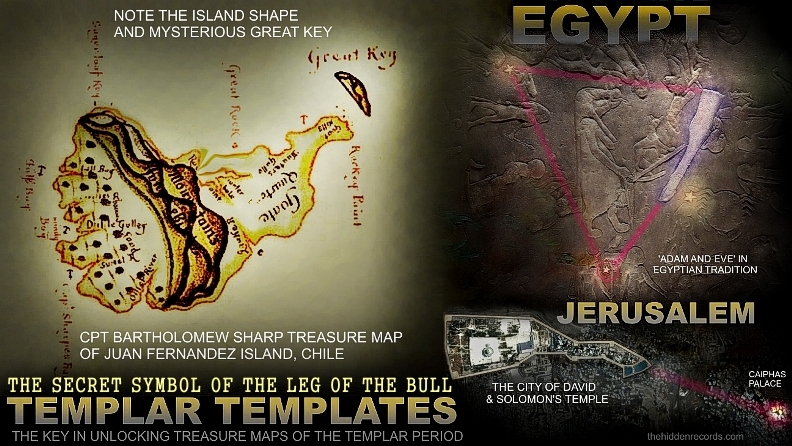 Moses would build again their own sacred city template in the most sacred symbol of all, the Egyptian Leg of the bull symbol ref a symbol that will solve the Oak Island mystery once and for all. The Templar code for the treasure map would need to be reflecting their sacred knowledge and so the finder of their treasure would be one either of their own or later one who knew the importance of the complicated very sacred human origin star map. If they chose an island to hide their treasure since the Templars would have left by ship, they would look for a very special island that firstly mirrors the sacred symbol on the Earth, and secondly it would need to have other sites or islands that would fit markers for the Solar Trinity. I started thinking about the Island choice for this Money Pit legend while watching the episode where the 8 pointed cross was revealed. Then the screen cut to an overhead position of the island and it was one of those hair standing on arms eureka moments. There was the leg of the bull Templar template in front of my eyes. 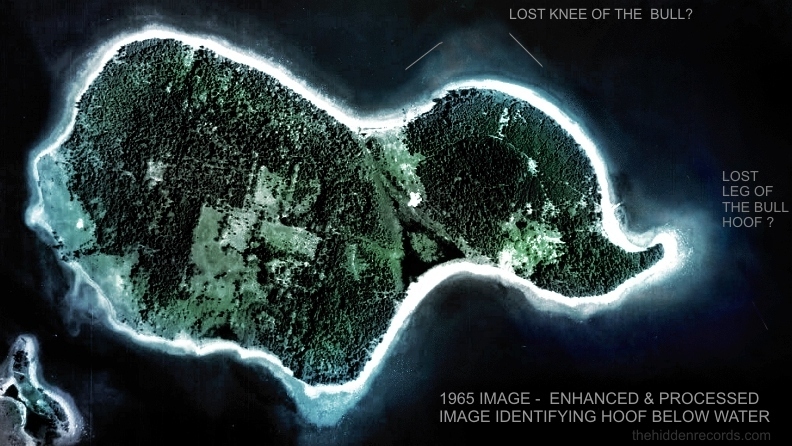 I thought the ultimate thought... what if the strange eye shaped place where the treasure is buried in the image we have already seen, an shown again below is another island nearby and positioned in a true correlation? I went back to the stone map seen below and looked again at the eye shape and looked at the extended line placing it awkwardly out of the triangle template it should be in. I realised this is a zoom in account here of a possible island. It was time to go on to Google Earth and look from the view of the heavens. 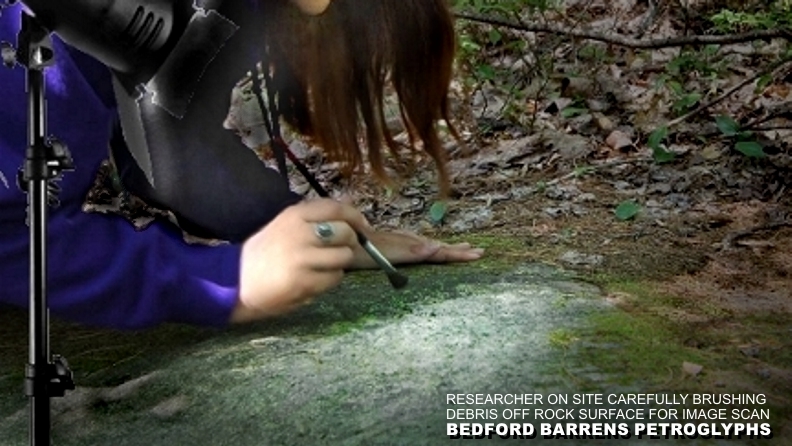 This story has been updated after launching this article with a local researcher who is involved with her own research living near to the Bedford Barrens petroglyph site in Nova Scotia. She made a breakthrough in 2010 discovering my the star map proposed 'template' in my work fits is depicted at the Bedford Barrens petroglyph. She had proposed my work as a template in identified Orion's Belt and Pleiades and agreed the Solar Trinity inscription is the solution to the stone carving. Here is the link where she used the avatar 'Volux' in 2010 ref. Here is a new post by this researcher with date stamp May 2015 on the same forum with same avatar proving she is Volux: ref. "We welcome you to the scared place and ask you to look, FEEL and reflect while leaving no disturbance behind"
We were a little uncomfortable with this wording inviting people to touch the rocks and perhaps should be changed to asking and in bold writing please avoid standing on or touching the rocks completely. After weeks of photographic scans and unique technique and image processing that brings the faintest of carved inscription alive, my researcher contact completed her imaging with stunning new first ever published clear detail revealed. She is seen here below very gently removing loose surface dirt and debris with a clean dry soft bristle camel hair brush like women use for their face preparing for the image relief scans. This researcher is a dedicated conservationist and also one who believes these rocks are sacred and it even bothers her just touching the rock with her hands, hence the soft brush approach. There are very strict conditions that are adhered to here for any petroglyph site and this we honour and we hope that after our work becomes more viral it will inspire the Canadian parks authority to consider placing a small 60cm high chained enclosure around the glyphs to prevent people with sand on their boots walking on them. After uploading all the image scans I set to work in decoding what is carved and what is natural. Each image was scanned with different relief becoming visible with each different scan setting. All the natural detail computed against that which is not natural. The obvious inscribed detail was then processed and all the time cross referencing the results were true with the images taken at various angles. Then with added contrast and hours of processing the rock came alive. For the first time in public the rock is photographed in perfect definition for study. This record is critically important until this site is more protected. The Holy Grail dwells here... it has the Orion stars beneath it confirming the three in a row Orion's Belt and confirming the first original sketch showing linking lines for just three of the dots. The seven stars in the top left circle confirmed... it appears convincingly as we had proposed before with Pleiades theory but to add to it, it seems to be a human form holding a sun with Pleiades. If you mouse over the image above you will see how the detail comes alive and the Chaco Canyon star map of the historical American Indian records show the same deity with Pleiades theme ref . The detail on the right as proposed previously clearly depicts the Apple Island area with an 'x' that marks the spot as per all the other star maps I have covered so far. The white glow area is the correct distance from the Pleiades too as the sacred area is chosen. Templars might believe buried treasure would be hidden in a sacred heavenly place. 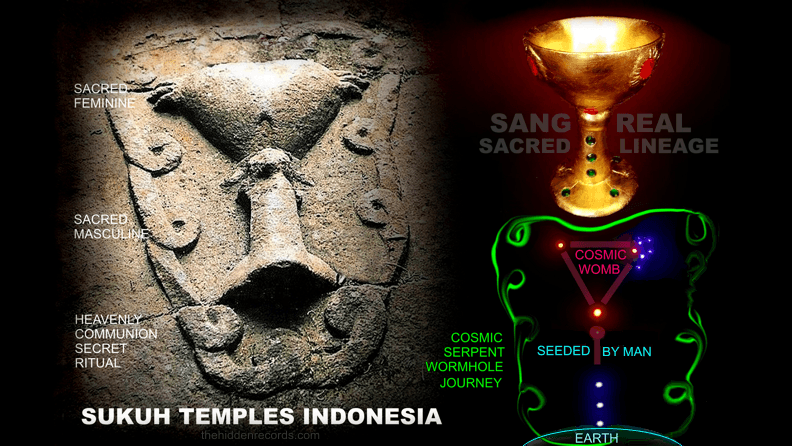 As Above so Below is how the legend goes and the ancients all around the world place their most sacred temples in the places of the most sacred stars. 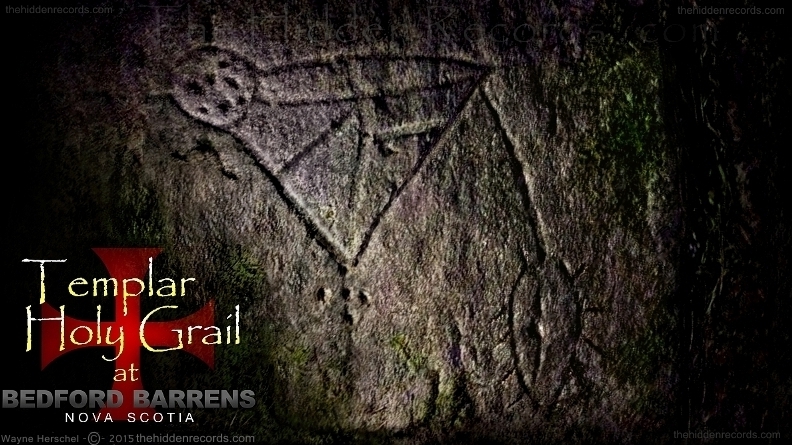 The rock shows it has the Apple Island sketch 'attached' to this sacred place on the Grail position as a star map matching the Sun star of the Templars. The same star as the Bethlehem star in the Christ story. The base of the Holy Grail came to light as the debris was cleared. The hidden carved detail missed by previous researchers helped identify it is a chalice with its base! The detail now complete matches my previous research on the Holy Grail. The discovery of the Grail chalice and ritual decoded and explained here ref . The general symbology origins of the Grail explained here ref . 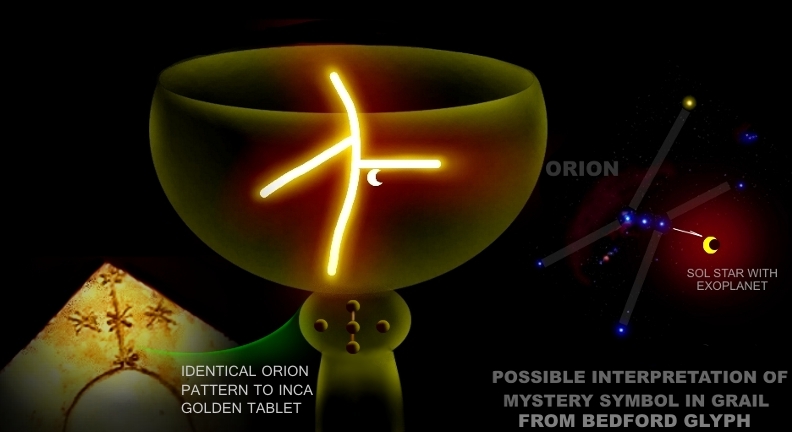 Something special about the Bedford Grail glyph is the use of Orion identical fashion in the blade part of the chalice (symbolic of the sacred masculine) which is identical to the Golden star map tablet of the Inca ref . 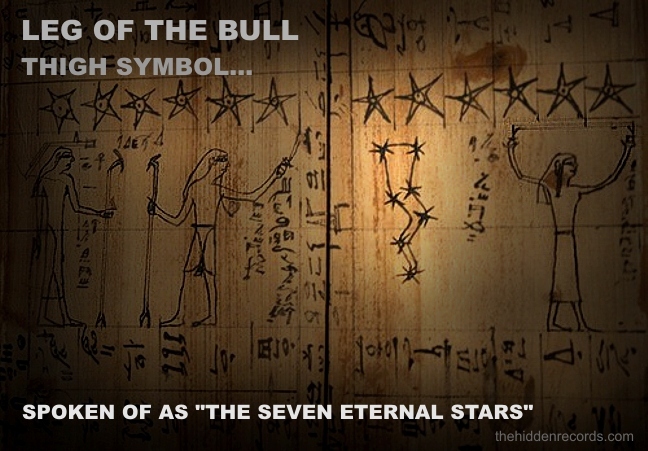 It has a line through the belt stars representing the male anatomy of the celestial Orion hunter of the bull of Taurus. The rarity of this symbol is emphasized and how likely the Templars had records that can only have originated from exactly how they believed... sourced literally from an 'angelic' encounter from the heavens. The strange symbol at the centre of the Grail chalice is quite interesting and might be a secondary encoded sketch explaining what the Grail is. 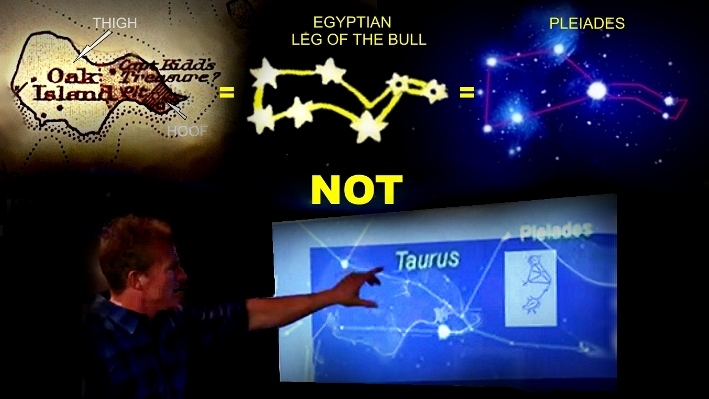 I recently presented evidence the Holy Grail itself is most likely a star map of human origins using Orion ref I have to say there is a chance this mystery symbol shown above explains the 'meaning of the Grail' itself. That the cross of the churches is Orion as a means to locate the exoplanet and its sun star. An interesting 'coincidence' with the symbol if it is Orion is that its oddly tilted. Why is it shown tilted? In doing this it coincidently also aligns direction with the position of Apple Island as well as the crescent explanation. Is this a way of beckoning the Templar with knowledge reading it of the location using astronomy, the sacred As Above So below belief to look for the 'x' marking the spot at the centre of Apple Island? Look again also at the HO stone mentioned earlier... it too seems to have an Apple Island sketch marking. This symbol interpretation is a long shot and just a controversial theory and worth considering only because of the astronomical value. The star secret means everything in this enshrouded encoded mystery in cracking where the treasure lies. There is more to update here with bigger breakthroughs and more referencing is needed before going further. Mouse over the image to see it come alive with the comparitive details. It is important to mention current developments. Our work to photograph the fading almost invisible petroglyphs for public view has not been recieved well at all. The project is complete and we want to make it known there are some unexpected reactions being published. Some expressing anger and some who feel it important to ridicule our efforts, even calling us criminals. We followed standard protocols and extreme care of the petroglyph techniques to render these images and their meaning public. While we prepare for the most important new findings release on the Octalpha glyph that will shake the very foundation of the Templar secrets known to date, I just want all those who have seen the verbal attacks know we have taken actions to clarify more on the website here as the story develops. Some say these people have some sort of agenda who want this truth twisted or silenced. When you see the new breakthroughs in this research you will see why. Some say this treatment of us is motivated by those who are invested in it need this story to remain an unsolved mystery. Others say the symbols are starting to present a strong case to prove the Templars knew the identity of the Christ and angels and how this knowledge ties to a very different human origin secret. I think it is the latter. The glyphs are about to reveal a lot more and logic and reasoning will carry the updated findings to a more solid conclusion. The island called Apple Island has the exact sacred shape of the symbol for God, the Elohim... the all seeing eye! Here it lies just like in the map written in stone! It even had the little line the eye shape has joining it to the Trinity sacred feminine womb ref that the sketch reproduced so well. 'X' MARKS THE SPOT ? The tiny island up close is the perfect place to hide the treasure not just because it fits a heavenly template but more. Consider these factors. 3) Apple Island has just enough tree coverage to bury the treasure and all activities not be seen once the ship sails further away to stay on guard. I have placed a small clearing where I believe the 'X' that marks the spot trully resides and it is now time for authorities to get there and secure further study. Lets accept the inevitable now... it is too late to cover this up and there will be many watching closely. I was looking online for a drone image or light aircraft image of Oak Island to see if some had great weather conditions and still water conditions. Calm water means clarity of its old shore line. I was tryinng to look for the true identify of Oak Island's old shape when the sea was lower 500 years ago when the Templars arrived here. I was fortunate to find two great images. The latest one being a picture that shows a defined ridge under the water where the proposed correlation for the missing knee and hoof of the bulls leg would be and the other from 1965 image showing best clarity on the hoof shape. I have written to the person who found the image so I only have a facebook image reference here ref but will update and credit the photo source once it is verified. 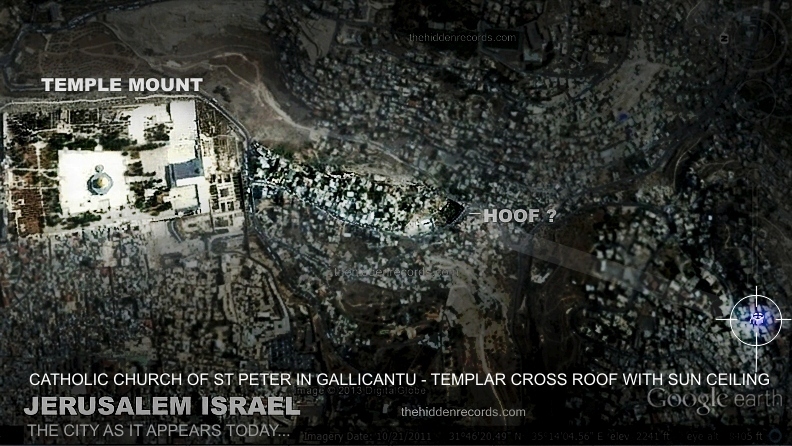 The 1965 image refverifies why the Templars would choose the Island because 0ver 500 years ago with lower sea level it was a good match to the sacred Leg of the Bull template of the City of David in Jerusalem. All I had to do was enhance sharpen and add a little colour. There is the remains of a small straight ridge below the water. I believe it was once more visible above the water and later destroyed in stormy seas errosion. 1) We have firstly the greatest evidence here of the ultimate star map overlay of Oak Island with the leg of the bull symbol from Egypt and Jerusalem and Apple island correlates in position as Sol 1 Primary the most important Templar Sun star in all the star maps I have found to date. 2) We find the Templar star map theme in the decoy Money Pit saga using the simplified part of the star map using Orion's Belt but it was not the correct 33 degrees arc distance scale on the ground so to Templar eyes... it was most likely a decoy. 4) We conclude the story having Sol 3 explained in the stone inscription where it slots it in Sol 3 position in the Templar Trinity map and it shows what the ultimate sun star Sol 1 should look like in shape... its Apple Island! Apple Island seen in the above image has the 'X' that marks the spot I have added and proposed where the treasure would have been buried. The island would have been the same shape it appears now between the period of the treasure legend of the Templars around 500 years ago until today. The gereral scientific body all agree sea level has not changed that dramatically over the last 2000 years ref . But even if we take maximum deviations seen in the graph link that follows they still place 'spikes' of some slight deviations of within 2m at the most around the world ref . This means Apple Island shape although bigger retains its unique shape with 'causeway' during the Templar Treasure legend period. Here is an interesting thing. 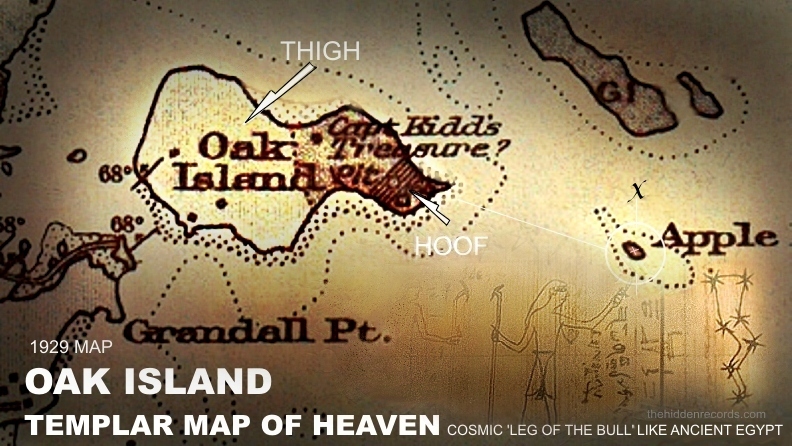 If it was like this since Oak island has steep banks it would retain the shape of a giant leg of the bull geoglyph. In 3D! 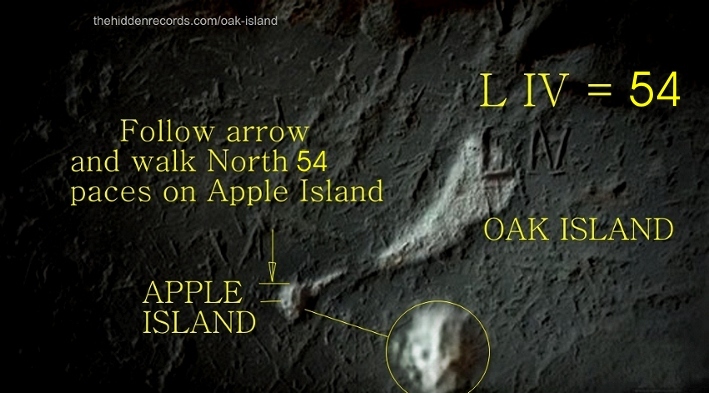 But this gets even more interesting because Apple Island also has a steep relief shape so even if the whole area was well above sea level this Apple island shape will also stand out like a massive giant secret symbol in 3D. A map in 1929 of Oak Island now delivers the proof of its shape apparently before a hurricane transformed its coastline shape some years after the map was made. No need for any more speculation or theories on its appearance... this was the island's earliest 'trusted' depiction and the online reference is here ref . Mouse over the image below to see how a 2m deep pit could be possible as it stands with Island height above sea level. The Island is literally covered in large deep set rocks at its centre too. The Templars would need their treasure hidden at a site that people do not frequent at all, a place away from human activity and site chosen for there to be no reason for others to be there. It need to be impossible to dig there too unless you are of a select secret society where rock excavation is their business. The Templars were Temple builder masons, so much so, there is a thought that they were the people that became the Freemasons when they were hunted down in the past. This Island too small for any habitation or any use at all has its own causeway for a once grand mooring of a ship laden with booty. It would be possible to dig a pit between 4m to 8m wide too. That would make better sense in recovering the treasure later rather than a very risky and troublesome deep pit seen with the decoy money pit. This recovery of Treasure operation I believe has occurred some time ago around the time of colonisation of Washington DC 400 years ago. There is probably no treasure and all we have left to explore is to verify another empty money pit. Some say the early American colonisation developments were funded on this amazing volume of treasure. The first high resolution up close image of the Octalpha Templar petroglyph is complete, here is the image below with all its new confirmed mind blowing detail. Mouse over the image and I will discuss my carefully researched interpretation. The biggest issue I had in this project was defining if we had cracks or lines. There are no cracks in the petroglyph portion and all the lines that look like cracks link primary pictographic elements. Then following the top portion it opened up into a mouth with teeth (highlighted green). This petroglyph is more a Templar theme than anything seen so far. For starters as mentioned the oldest historical match to this Octalpha symbol originates in a previous forbidden manuscript titled Beatus of Liebana ref a codex historical Gnosis Templars would hold sacred. The manuscript shown earlier depicting the Octalpha is the very same manuscript showing the detail I have added in the mouse over image that completes this symbol's meaning. The small crescent world at the bottom is most likely Earth and it is of Sumerian type and of the type in the manuscript. The green glow parts are all cosmic dragon serpents from the manuscript and the blue orbs are worlds being traversed in visitation as they visited our world too. The dragons in the manuscripts have the worlds on their heads. This glyph has some historical non fitting Roman Numeral IV marking all around it... there are also 4 of them. I have a concern this is a clue to a masons mark and a hint the treasure map story that follows that there might be another empty pit. Its quite easy to dig from the tree line and tunnel beneath these flagstones if the treasure map concerned here says the gold treasure was 8 ft below it. This strange serpent dragon theme and Pleiades and Suns is typical Scotland Picts and Celts traditions ref . This is where this imagery is better explored so please check it out. In considering these mason IV marks I must add another new conspiracy theory here. If you were one with a treasure map and knew the treasure was here 50 years ago and it was listed as a historical protected site what would you do. The land was up for house developments in this time and you could build a house right next to it too and... well... you can imagine the rest. It would be amazing if the house owner who built remotely and akwardly next to the site here has the family name matching the treasure map owner that is about to be explored. 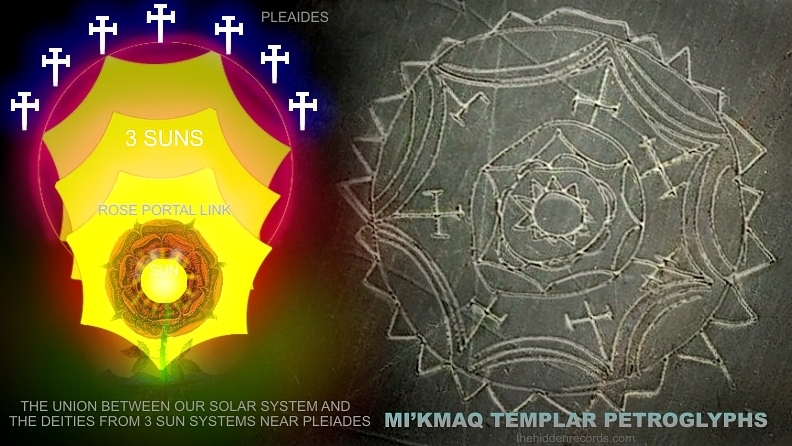 The Mi'kmaq tribe who were first people ref in Nova Scotia have what I believe is their own cross and star and crescent exoplanet world knowledge of the ancient Taurus star map knowledge ref . They probably saw the importance of the symbols and knew their meaning and perhaps they might have assumed it was their ancestors who put it here and adapted it in their artwork the last 500 years. I cant find evidence of the octalpha or grail in their culture previous to this period at all. Many local Mi'kmaq researchers and tribes elders believe historical Christian symbols seen in Mi'kmaq history are inspired by interaction between the first European visitors. See the concluding last line in this article by a scholar ref . But the timeline from 1398 claims more... that the famous Rosslyn Chapel Sinclair family of Templars that have record of the star map in the church itself ref arrived here first ref . There is another petroglyph in contention now with the same teaching and theme as the Octalpha in the Mi'kmaq article and it is absolutely breathtaking seen in the image below. 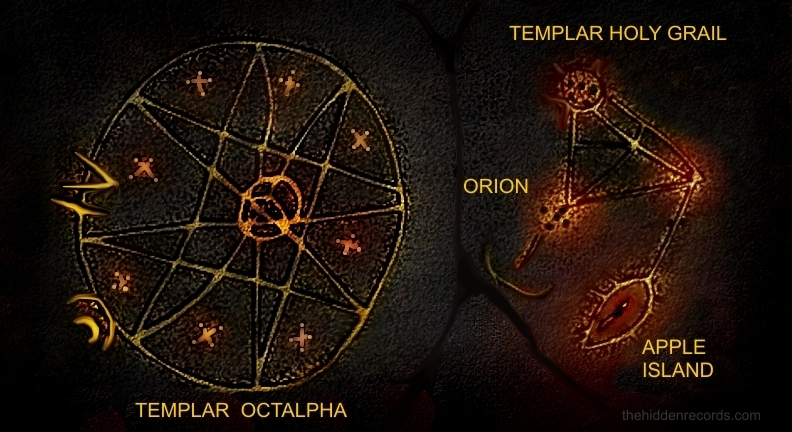 Here is the second Templar origin star map Kegi 'Seven Regions' petroglyph ref supporting my interpretations so far. 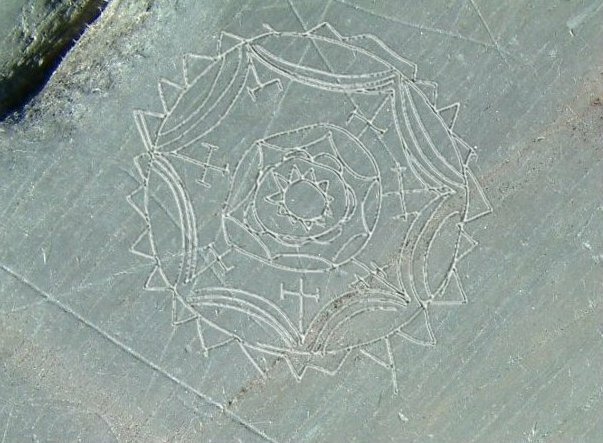 It is from the Kegi area Nova Scotia and has seven more defined Templar crosses for the Pleiades and three overlays of SEVEN pointed sun stars. A rose cross sun at the centre for the 4th Sun. This is probably the opening blossoming dragon mouth conduit as a rose to our sun positioned within the rose as I have offered in the Rosicrucian star map ref . It has most of all, just like my Octalpha interpretation, the outer circle as a blazing sun ref . The Mi'kmaq oral tradition of its meaning claims it is record of the seven districts. Ponder on that thought. Seven areas on land or in the heavens? 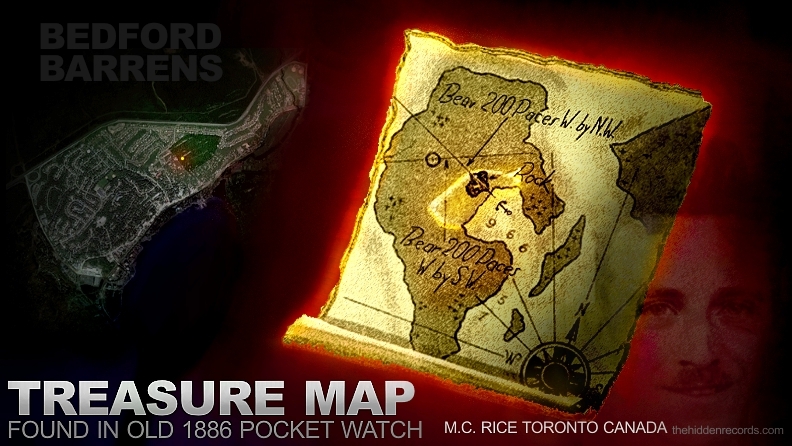 While browsing the website of 'The Steward' ref looking for more Oak Island area clues, I was going through the treasure maps I noticed one of them was without doubt a Canadian story when it was re-discovered in Totonto Canada in the 1800's. 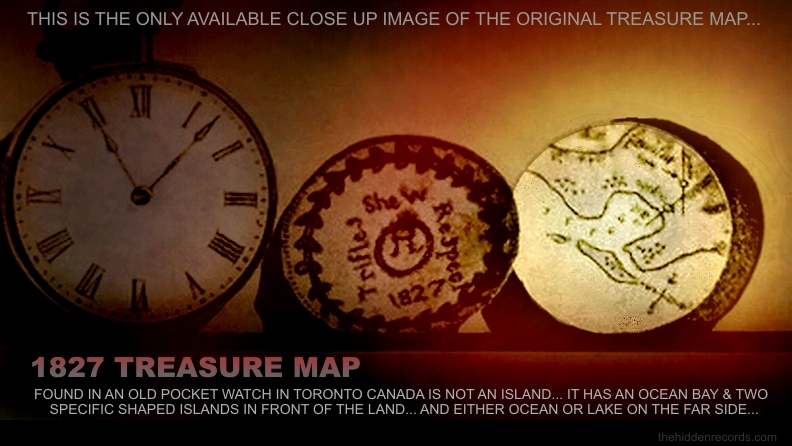 It claimed an ancient treasure map was found in an old 1700's watch and it was dated as writen in 1827. Here is the Canadian newspaper clip and the only image source of the map. ref . 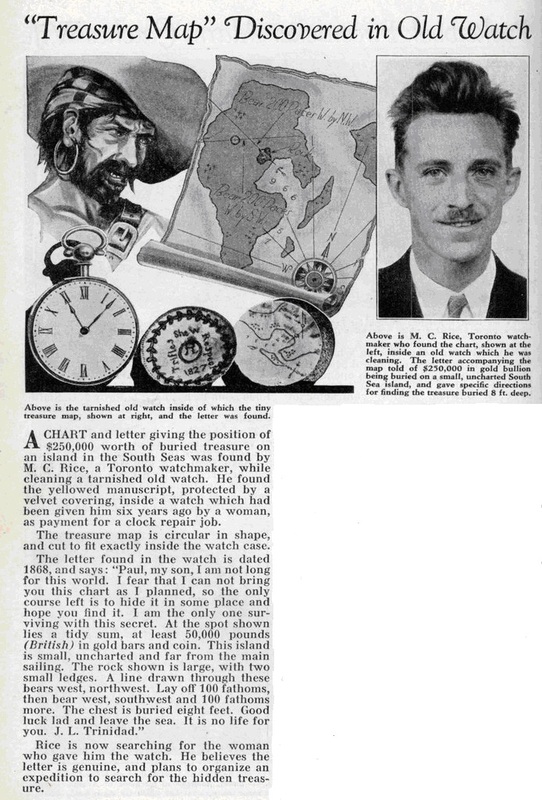 The image below is of the watch and the map that had a message with it. Since by chance I was alreading working with maps of a bay like this near Oak Island and already by chance had found some exciting clues about a possible treasure site might exist where I was working, I had a little eureka moment... this was the place on the map that seems to place the 'x' exactly where I was researching! The best way to write about how it all happened needs me to recap all my clues so far then you will see how the finding actually occurred. My clues to date. Firstly as you have read so far, without doubt the strongest clue in decoding treasure maps is to look for the Leg of the bull pattern and I was already armed with this tool. Look closely at the image above. If you look at the land shape without the bay then this land shape was a pretty good match to the leg of the bull shape too. I have been working with so much imagery already in the Bedford Barrens area using maps and all the latest images taken by our researcher on site. There was one image of the Glyph site seen below that showed what the rocks look like and I asked the researcher to please send all images of the area. There were deep rooted trees around the rocks so there must be a certain depth of soil. Although it looks like natural solid rock geology I was sure these were flagstones as suggested in the image below. Most believe like others here that these rocks really look like natural solid rocks and not placed rocks because this entire Bedford Barrens area is one massive geological solid rock area. This was how it got its name. It was barren and not many large trees do well growing on the solid rock. Houses cant be built as plumbing and sewage is not possible. I looked again at the treasure map which had a rendered version enlarged as the owner of the map a century ago tried to have a better version of it to work with. This is his enlarged version below where he showed it like an island. My mind was struggling to see the bay as part of an island because there a few things that I recognised in the map. I will start listing them as points so we can use them in an evaluation. The minature map and the larger rendered sketch showed there were two smaller islands like in Bedford bay! 1) The MacNabs Island and its smaller counterpart are the two islands ref one passes entering the Bedford bay area of identical shape. Then I thought how on earth can this map show an island if the area I thougth it might be was mainland. I then looked again at the source miniature map and realised it was not an Island at all. It was an ocean bay with two islands in front of the bay but the land could be mainland and the later sketch either added their own extra decoy or something made them believe more than the sketch it was an island. “Paul, my son, I am not long for this world. I fear that I can not bring you this chart as I planned, so the only course left is to hide it in some place and hope you find it. I am the only one surviving with this secret. At the spot shown lies a tidy sum, at least 50,000 pounds in gold bars and coin. This island is small, uncharted and far from the main sailing. I have highlighed text above where it claims it is an Island and realised another obvious mistake might have occured. It was written in Ye old English and no doubt paper creased and in tiny messy hard to read handwriting. 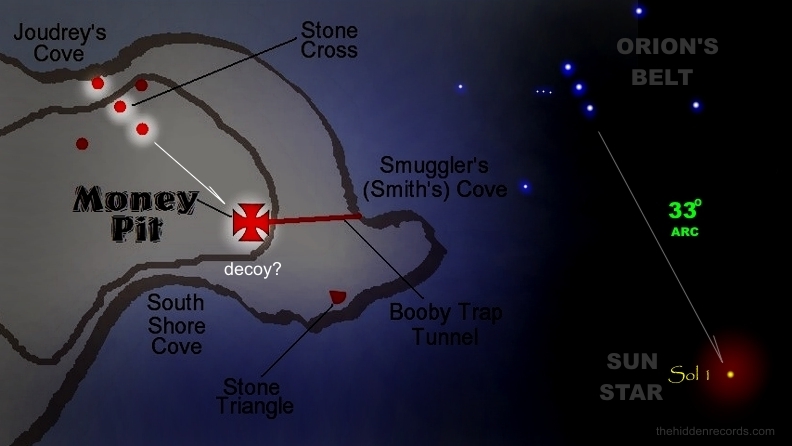 In the image below I have outlined where I believe the real bay with treasure lies and I need to add it right away so you can reason each clue. Coincidently the area outlined has similar leg of the bull shape and for now since there is no explanation why the roads followed around this border pattern but it is what it is. I have shown where the Glyphs are placed too and the Bedford Barrens... one massive geological rock formation enhanced in dark green. Another obvious match to the miniature map was there really is a body of water caled Jack Lake where according to an old map was previously bigger and where the old 1800's paper mill is mentioned on the Facebook historical page for Bedford ref . At the spot shown lies a tidy sum, at least 50,000 pounds in gold bars and coin from an island so small, uncharted and far from the main sailing. 2) The land shown is probably not an island. 3) Jack Lake fits for the second body of water in the original miniature map. I have added a small ghost figure on the image below where the leg of the bull land pattern fits and this leads us to another major point. 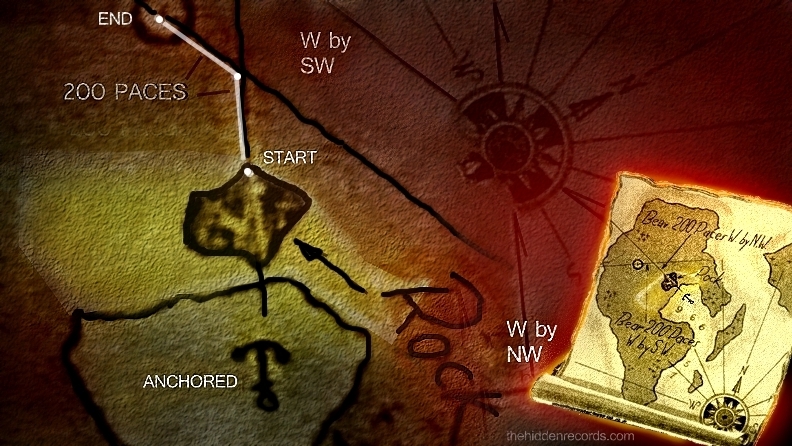 The Rock reference in the map. Look closely at the rock shape in the map and the shape of the Bedford Barrens rock area. 4) The rock position and shape matches the map. The image above shows the new owners carefull enlarged sketch and I have added a ghost depiction here of another Leg of a bull site. It is the new area in contention that is the nearest and closest most secure bay area for any ship escaping from a storm if near Oak Island. It is Bedford in Halifax Nova Scotia. If all I have identified so far is true then the bay position and its shore line need to be an exact match to the coordinates that are about to be tested. Only if this matches then do we have a good theory and to be blunt, and only if there is something substantial where the two sets of 200 paces take us elevates the theory into a measurable hypothesis if the Templars have left their final mark. 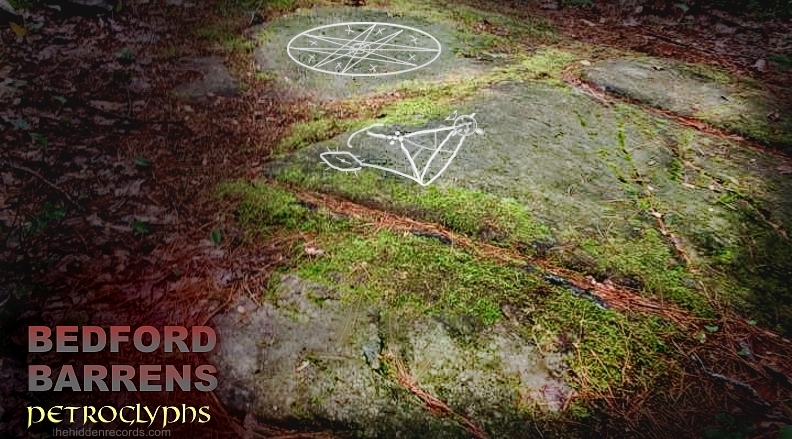 The shape of the Bedford Barrens is like the ancient sacred Vitruvian man elongated pentacle/pentagram ref , a shape the Templars I expect would know well. I measured the two defined directions and paces and it lands you right where I started and I couldnt believe my eyes! 6) The Petroglyph site is where the treasure lies. Mouse over the image to see what I believe is a tomb-like capstone or flagstone and what probably lies 8 ft beneath it. If this petroglyph site is the treasure site then lets take a second look if the Templar inscription on the strange tomb-like rock is perhaps explaining here lies the treasure? We have a Holy Grail depiction. Is this not the ultimate treasure of the Templar? We have the X inscripbed on the Grail. Is this not the proverbial 'X' that marks the spot legend? If this is all no coincidence then we can now recap what might have happend in this Oak Island treasure legend. Consider the most likely scenario in any Templar treasure quest to hide it... then recover it later. They would never just bury it and forget about it. They would obviously plan to revisit it when it is safer to do so and in as fast a possible window recovery operation to secure it for again for themselves. Imagine a Templar ship came back here during a later safer period after the Templars were still in hiding after they were hunted as heretics. Imagine they have quickly recovered most of their treasure leaving some behind that might be too heavy to load or for a later date as security. What is the next safest thing to do before sailing to their big port destination? According to Templar and Pirate records there seems to be a common scenario that would follow after the treasure was recovered. It would first be to sort out their most prized pieces and leave the easier to stash durable coins and heavy gold bars to bury in another safe place. The reasoning is obviously just in case if they are caught then they dont lose it all. They would be leaving the Oak Island area and head for another safest and closest possible destination where some treasure can be buried again in secracy. 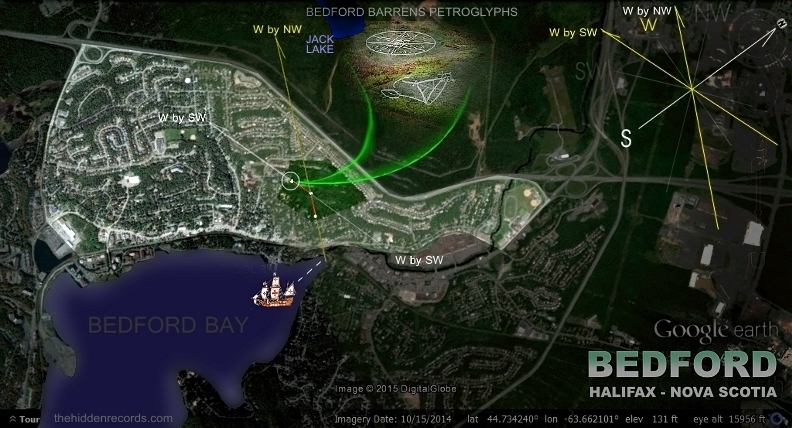 The closest secure weather place to moor and hide treasure is within Bedford Bay. A place only they would know while leaving only clues only the fellows of their brotherhood could decode. After this they would set off for their main destination with most of the chosen treasure. I believe the main treasure hoard was taken to Washington DC and the founding Freemason fathers established their new city and America in the grand way it started. 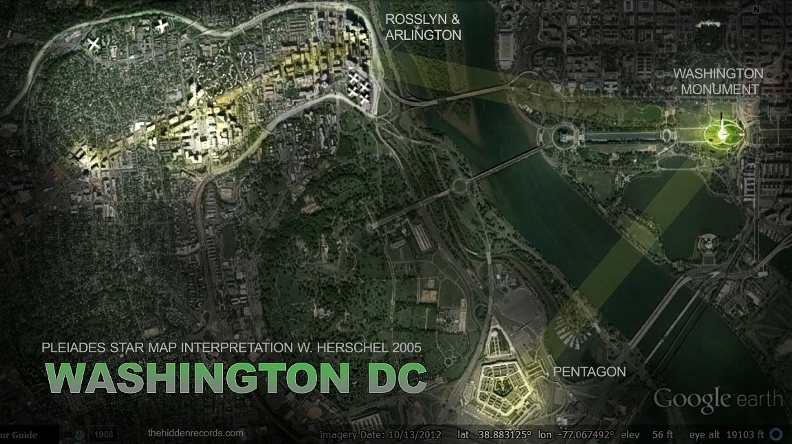 And... oh yes would they build Washington DC on the same treasure map Templar sacred star secret template... You bet they would. Some say the Templar treasure was found around the time of George Washington and it funded the building of his city matching Oak Island and Jerusalem template. It has the same layout plan. The Obelisk is the 'x' that marks the spot and has more to reveal. If Oak Island was watched over by Templars, the ownership of the island and all excavation rights would no doubt stay within 'control' of their own people. I have never thought about a connection possibillity between the people having the rights of activity here at Oak Island in this way and if they themselves are under strict protocols and higher powers. There is just one clue here that has me wondering and it is the passion one of the brothers (ref) has with his winery business Mari Winery (ref) . He has included on his grand floor they call 'the oculus'. This name alone speaks volumes. Few know Templar history used this name for occult references to a cosmic window/portal to heaven, a whole new story which releases shortly. 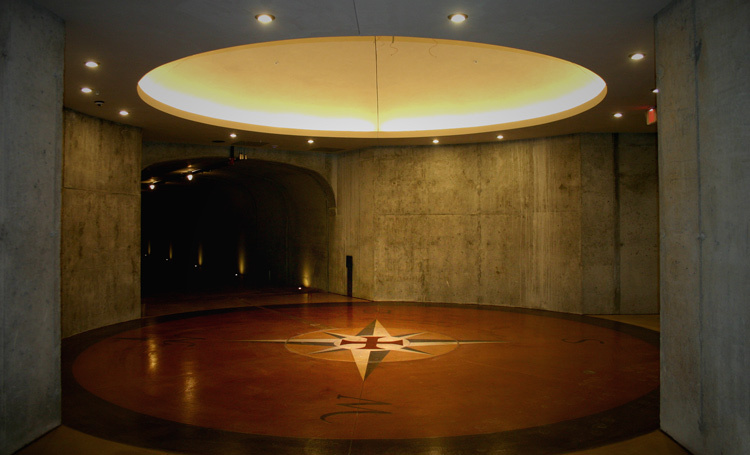 There is more... the oculus portal in Templar era history has legend also fitting the star map theory in Taurus, a portal to the area passing through the bull's eye (ref) which is the direction to the Pleiades. But the Templar clue I want to reveal shown passionately by one of the Lagina family is the ultimate symbol placed on an 8 pointed star (a theme match covered already with the Bedford Barrens Templar petroglyphs). It is the placing of a large 8 pointed star as a 'way shower' seen on all maps. The star is presented as the cardinal points of the compass. But the centre of this 'blazing' star... non other than a grand Templar cross. (ref). Is this just a little bit of fun and passion for history or is it a little more than a passion for the meaning of the Templar cross and an oculus as an old alchemy legendary secret? You decide. Does the map have more? An alignment line perhas to something? Go and visit and see for yourself! The latest image layer on Google Earth using the latest time layer slide control shows a whole new apple island image. Taken at high tide and in darker light conditions it reveals some shocking new activity. The area ringed in red has trees cleared and to the right of it there is a clear debris field! It appears like some very large and no doubt heavy boulders are suddenly on its eastern bank. I am waiting for my contacts there to go and film again to to confirm the rock debris but the clearing that is ringed in the previous image is now confirmed in this video taken June 2016. By the way... Prometheus film productions (who also produce Ancient aliens series) are currently preparing another season on the Curse of Oak Island saga for History Channel. Just when all thought with its final few episodes of let downs and fake clues and poor content that it more than exhausted the story. Will the truth find its way? Will Apple Island be brought into contention? I bet the truth will all be as per usual... covered up. SOLOMON SEAL CLUE AT OAK ISLAND? I have had many requests by Oak Island followers to add my old interpretation link to one of the Seals of Solomon to this page so here it is. They believe it will be included in the Oak Island mystery. 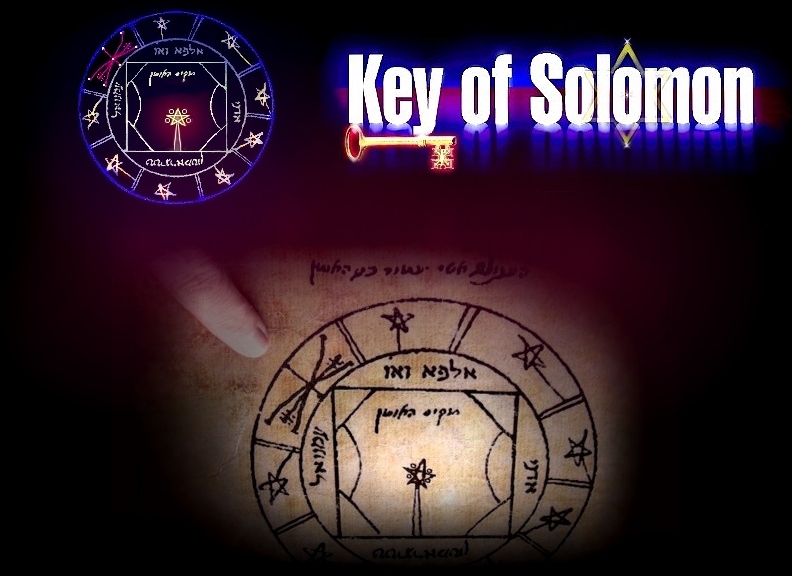 It has many symbols I decoded back in 2003 with my Pleiades Orion correlation theory grounding for the Templar symbolism for the actual Key of Solomon talisman. Yes, very expectedly, it repeats the very same decoded message as my Key of Solomon breakthrough in 2003. It seems another theory is about to launch soon by one of the people on the TV series experts on decoding this talisman so its good to compare and debate different theories as working towards truth is both our objectives. The person making the claim assured me we are 'worlds apart' as writers here. Click the image to get to the Solomon Key page where the decoding of it is discussed. 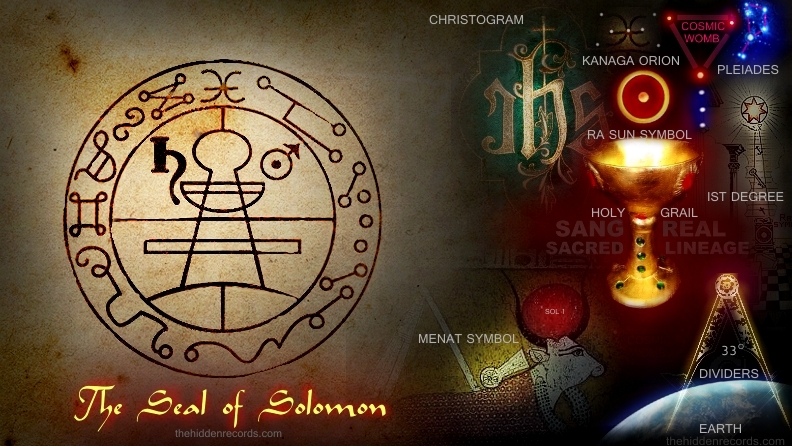 Solomon also used the Orion cross of the churches that aligned to the star of David. Simply decode the puzzle pieces in the outer rim and piece together the leg of the bull constellation coordinate. I think we are in for a really big discovery here on Apple Island. But one has to consider another possibility. I believe that the historical elite of the world have always known this history and went back to fetch their treasure. If they have always known the gnosis then we will find another empty pit. But for me knowing they used the star map template is a very big deal. 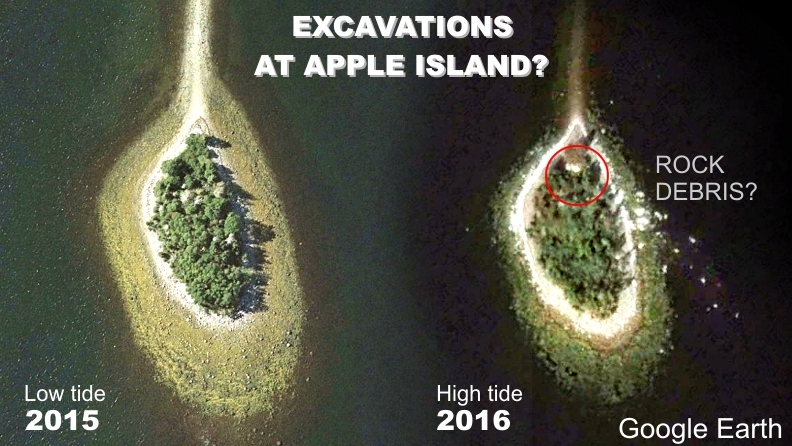 I ask all who know my work and this story to please share and spread the word if they believe it is important to excavate Apple Island and in public eye. It stands less chance of being covered up if this occurs. 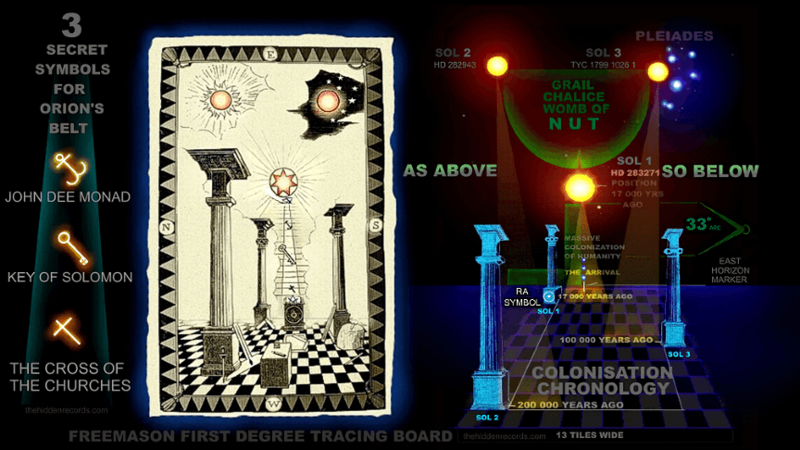 The Templars valued the 'Sang Real' sacred angelic lineage secret of humanity that they celebrated in communion ritual using a gold chalice on Sol Invictus as Sol 1 rises above Orion's Belt on Eastern Horizon. It was this gnosis that led me to decode and find the very secret of the Holy Grail itself. 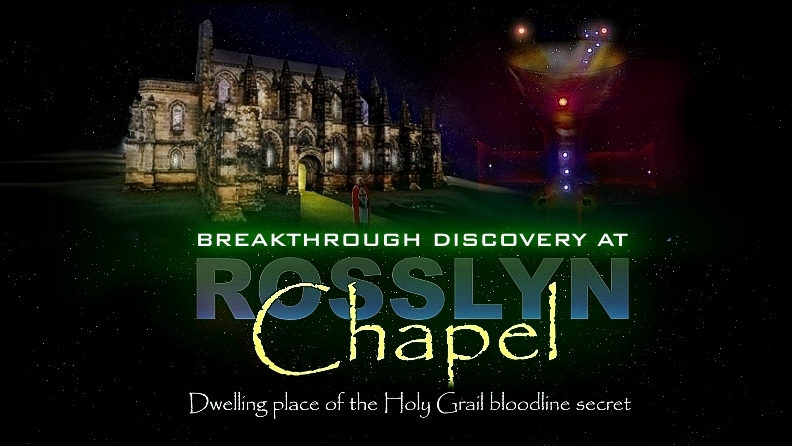 The journey led through Scotland to Rosslyn Chapel to see the very same Templar star map and Grail. It was sensational to say the least. ... and how Neanderthal lost his destiny in an 'alien' invasion of our celestial ancestors.